More about the races... Wednesday, 7 July 2010 A summary of how the Aussie team did and what they thought aboud the races. And training continues... Wednesday, 7 July 2010 More about the Aussie team training camp in stinking hot Portugal. Training camp begins Monday, 5 July 2010 Now all the Australian team has safely arrived and got their first taste of Portuguese terrain. Less that a fortnight to go!! 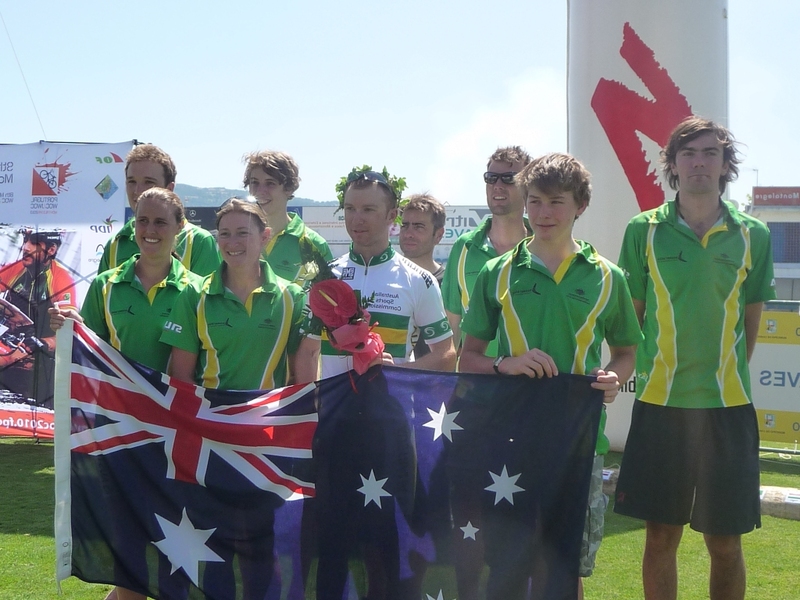 Monday, 28 June 2010 With less than a fortnight to go, the Australian team has begun arriving in Europe and will be meeting up next weekend for some warm up races in Portugal. Long and Middle distance races: Gdansk Wednesday, 9 June 2010 Melanie´s wrap up of World cup round two held in Gdansk, Poland. Round two of the World MTBO Cup: Gdansk, Poland Friday, 4 June 2010 The second round of the 2010 MTBO world cup begins tomorrow in the forests around Gdansk, Poland. World ranking events in Denmark Tuesday, 25 May 2010 Melanie´s experiences at the recent WREs in Denmark. 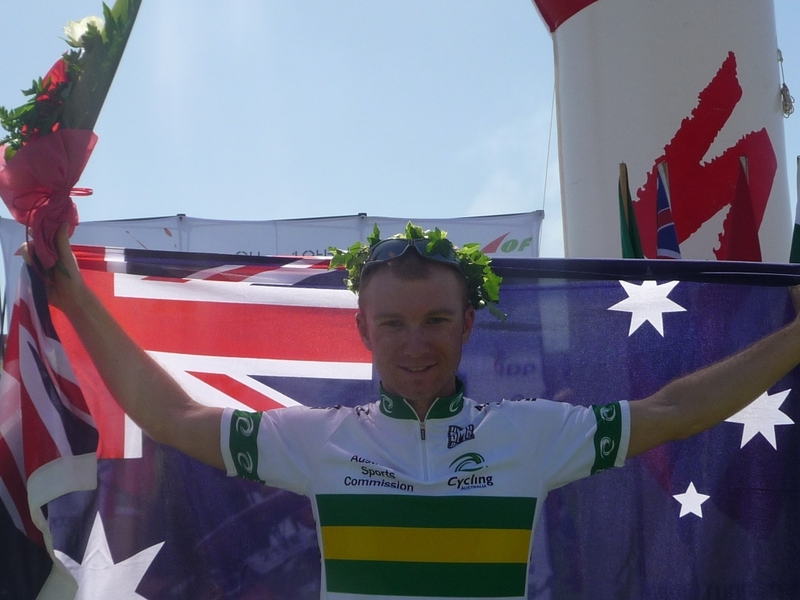 There was, yet again, much excitement in the Australian team camp as AJ rode to get his third medal in the individual races. He held onto the winning position until very rear the end of the race when Russia's Anton Foliforov came through to take the gold. AJ is the only elite man to have finished on the podium in every distance, let alone to have won a medal in each!! 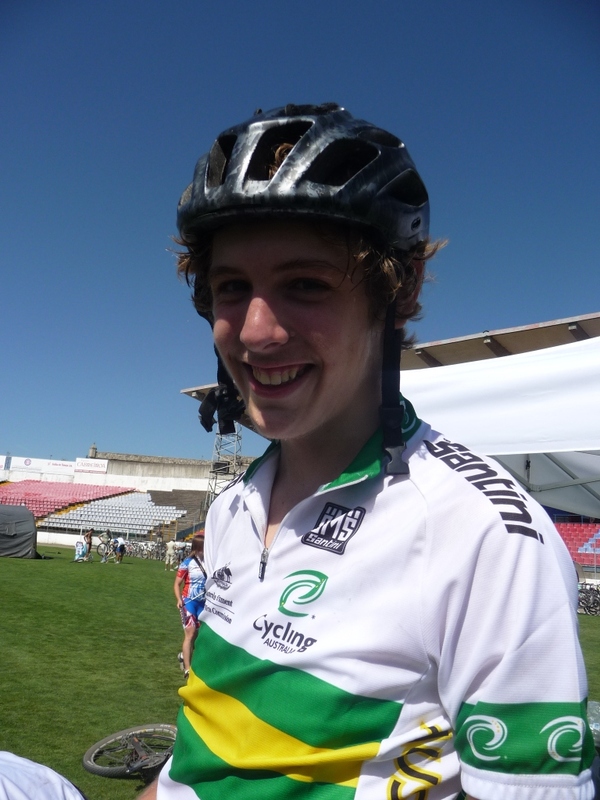 Alex was reasonably happy with his ride and finished in 27th position. Both he and AJ crashed in a semi-concealed ditch - AJ came out with bruised ribs and Alex with a sore wrist which fortunately does not appear to be fractured on x-ray. Steve was disappointed with his ride, having made many smaller errors throughout the course. The men's course was a gruelling 38km with over 1200m of climb and the winning time today (1:53:03) was only a few minutes over the expected winning time for a long distance race. On the other hand, the women's course took around 15mins longer than expected with Christine Schaffner (SUI) winning in 1:54:05 (normally a women's long distance race would take 95-100mins). Melanie and Mary both had solid rides, however lost around 5 minutes each towards the end of the race. Melanie finished up in 20th position, a mere 13 seconds ahead of Japan's Sakiko Miyauchi who had been training with the Australian team last week. Mary ended up in 28th. The junior boys had a similar distance and climb as the senior women - about 30km with 930m climb. Marc had his best ride of the championships finishing in 25th position. He had a few mistakes around indistinct junctions, however recovered himself and his fitness has really paid off on the physical course. Luke was relatively pleased with his ride and finished in 30th, at one point he was feeling quite strong on a hill and offered himself a bit of moral encouragement, only to find that another rider was within earshot and looking at him strangely. Chris had some early mistakes and had difficulty recovering his enthusiasm and navigation. He finished up in 38th position. The relay tomorrow starts at 10:00 for the mens and 10:20 for the JWOC teams. (Pending a decision on Alex's wrist and if he is prepared to ride with it, Mary and Melanie will be riding in the "Men's B team" with Grant). Before we forget, yet again, something you may want to check out is a you tube video made by a British rider, Mark Stodgell, who has condensed a helmet camera recording of his sprint ride into a 7 minute demonstration of how tight the streets were, how close the cars got and how bumping the cobblestones are! Check it out via his blog or on you tube. Today saw the JWOC classes have their re-run of the middle distance final after the cancellation of the courses yesterday due to a misplaced control. Our Junior Men all had pleasing races with Chris finishing 28th and Luke and Marc finishing 39th and 40th respectively. Chris said his race was fairly clean and mistake free. Luke and Marc both made a few small errors, but were still quite happy with their performances in their second hard day of competition in a row. The start order for the Long distance final on Friday for the Junior classes will be reverse order from the Middle distance results today. In the WOC classes Adrian, Stephen and Alex all finished in the top 10 in their heats, but Grant missed out on making the A final after finishing 24th. Adrian rode a quick pace for around 3/4 of the course before easing off to save energy for the tough race on Friday. Stephen had a clean race and was close behind in 10th position in a closely packed A heat. Alex had a good race despite not feeling 100% physically and finished in 10th position also. Grant rued a late course error and a poor route choice which ended up costing him a spot in the top 20 in his heat. The drama of the day came from the WOC women, with 2 competitors having to be ambulanced off the course after bad crashes on the steep rocky tracks. Melanie along with Anke Dannowski (Germany) stopped to help the most seriously injured of the women for more than 40 minutes. The Czech competitor was very seriously injured and has been airlifted to Porto and is expected to be operated on tonight for a broken spine. Mel otherwise had a clean ride, although rode very gingerly downhill. Mary tried to conserve as much energy as possible in the steep terrain and was happy with her ride and time. 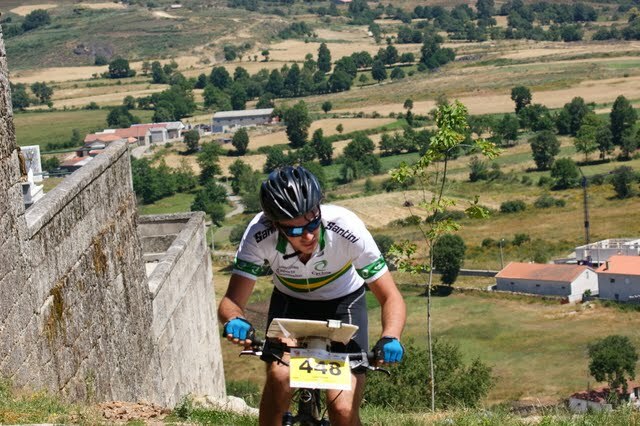 The good performances of the Aussie MTBO team continued today in the Middle Distance Championships held in the forest adjacent to Montalegre, the host town. Adrian Jackson (67.14) again rode brilliantly to snare the silver medal, just being outpointed by the Flying Finn, Samuli Saarela by 40 seconds. The large Italian contingent went berserk with joy when it was confirmed that Luca Dallavalle had held on to third, to be Italy’s first ever MTBO medallist. Adrian, not having a top 10 world ranking due to not racing overseas since last year, wasn‘t eligible for a red group start at the end of the field. He thus was midway in the 94 starters and had to endure over an hour wait to see where he would finish. Grant Lebbink unfortunately drew the very first start and was reasonably happy with his navigation, and finished in 48th place in a time of 83 minutes. Alex Randall was very happy with his ride and was in the top 10 for a long time until slipping to 21st, in a time of 75 mins. A great result given the ever increasing depth of the competition. Steve Cusworth was unhappy when he finished due to many small time losses and some dubious route choices. However his 76 minute time and 25th place showed again what potential he has. The elite girls saw Melanie Simpson place 25th in 69 minutes, with Mel rueing a 4 minute mistake when she inadvertently rode towards a later control. Mary Fien was relieved to get a solid result (27th in 70mins) in the middle distance after bad performances at previous championships and is looking forward with more confidence to the long. Austria’s Michaela Gigon again reasserted her status at the top of the women’s field with a speedy 60 minutes, ahead of Denmark’s Rikke Kornvig and Finn Marika Hara. Unfortunately both junior championship races were declared void after a control was misplaced by 70 metres or so, being on a completely separate track junction. Our three riders found the control with losses of only about 30 seconds, as did most. Luke Poland had the presence of mind to take part of the tape that was in the correct place. Luke was stoked with his ride, having navigated really well after a scrappy ride in the sprint. He took 76 minutes. 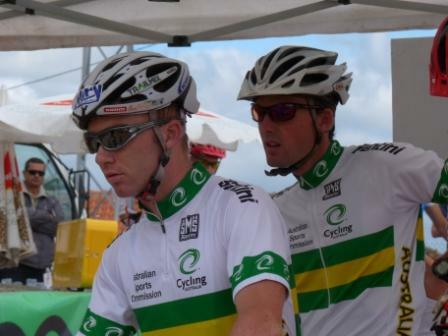 Chris Firman wasn’t so pleased with his 71 minute ride, so was surprised that he was placed approximately 18th. Marc Gluskie had some nav problems today taking 81.57mins but his fitness should see him bounce back in the long. The current plan is to turn the long prologue into the middle distance final, however we are awaiting details of how this will be organised and how the riders will then be seeded for their actual long final. The terrain was very hilly and winning times were 7-9 minutes longer than anticipated. Both Mary and Alex got caught up amidst different herds of cows whilst riding through a village. The finish saw riders coming through the streets of Montalegre for the final controls before finishing adjacent to the Cavado River on the edge of town. One item of interest is that all Scandinavian countries were represented for the first time, so the competition will only get stronger. The long distance qualification is tomorrow in the mountains behind Chaves, about an hour away. The miniscule Italian rider that all our boys are aiming to beat is actually 13 years and 6 months. Melanie put him in his place during the middle distance event by riding past him up a hill. Car trouble - going to the sprint the electronics of the van carrying all our bikes died. Kay was fearful that the automatic locking would mean we would sitting at the event with bikes locked away, but luckily the doors opened. Then on the return trip three different warning lights came on in the car and it lost almost all power. After an inspection by the Japanese team we limped home. As the next day was the bush model event on an area we had already ridden we decided to have an easy ride around Montalegre instead. Kay got driven for 3 hours in a Mercedes taxi to some town starting with "Br..." (apologies the map is not handy) to pick up another van and then had to navigate back through Spain to get home - so an all day outing after having to wait for the van. Then about 40kms from home the engine warning light came on in the replacement van!! So Mike Gluskie had the task of taking it to the nearby depot during the middle, which luckily was only 2 kilometres down the road from our accommodation. It was great to see that the age old skill of card playing still survives. As some people had over 2 and a half hours wait in quarantine at the start this was a good way of filling in time. The making of chocolate mousse became a team bonding session when everyone was conscripted to beat the ingredients in the absence of an eggbeater. The fastest hands in the house belonged to none other than AJ. After the middle distance race we had 3 Aussies in the open races in David Firman, Briohny Lebbink and Amber Tomas. Briohny has been doing a fantastic job as the additional team leader, co-ordinating the food supplies, cooking, washing and being the friendly face at the finish. We booked in for 2 meals at the event centre and after the first one all the boys said they were looking forward to Briohny’s home cooked meals again. The fact that our house has a dishwasher is a definite plus when there are 11 hungry mouths to feed. Today is an opportunity to rest and get our heads back into the 1:15 000 scale maps with MTBO mapping standards instead of the urban terrain. That and do some washing, reading books and visiting the local coffee shops. For Kay the "rest day" has involved a 2 hour taxi ride to collect a new van because our current one seemed to go into complete electrical meltdown. At one stage we were a bit worried that we wouldn't be able to get the bikes out at the sprint because the central locking was not working. There are some great photos and a short video that can be found via the official website or if you click here. Down the bottom this page you can also access the maps from the sprint. All three controls had the same last few controls and it was around here that caused a lot of confusion, not only in the Australian team, but many good international riders also came unstuck in that area. The structure is a fort that had a high wide wall that you could ride around (control 63 was on top of this wall) and then control 64 was down in the moat around the fort. Finally, quote of the day goes to Luke. At the opening ceremony we learnt that Montalegre has a (?pagan) festival every Friday the 13th where they have dancing and fireworks, costumes and masks all in an effort to ward off the evil eye (or some such thing). And this all occurs in the towns ancient ruined castle on the hill. I pointed out that this will be occurring in August and maybe it would have been interesting to be here! Luke was also very interested in the idea and enthusiastically asked "Oh really, what date?" My last urban MTBO WOC sprint was in Poland 2 years ago, where although I finished 6th it was a race where I never felt comfortable with the map and was quite disappointed with afterwards. So despite having surprised everyone, not the least myself by winning the sprint (my least favourite discipline) last year in Israel, I was once again nervous with the prospect of the very urban terrain facing us in Chaves. This was compounded by the fact that the town was going to be relatively open, with public and spectators wandering and driving through, so an element of luck was going to be involved to avoid having an accident! In the end there were no real problems, with dozens of marshals all around the city controlling traffic as much as possible and warning if 2 riders were about to arrive at the same corner at the same time! I started in the Red start group (last 10 competitors) by virtue of being the reigning champ, despite not currently being in the top 10 ranked riders. After waiting around for a couple of hours in the arena and warming up on the very dusty running track (we all got much dirtier from the warm up than the race itself!) it was time to hit the streets of Chaves. Straight away on the first control the 1:7500 scale got the better of me and I went straight past the gap in the buildings I needed to take, and despite not going too far past it was enough to lose 20 odd seconds. Another couple of hesitant controls later I saw Lasse Brun Pederssen who had started 1 min behind me on an in-and-out control, and he was probably now only within 30 sec. This spurred me on, and for the rest of the course I had no more wobbles, and maybe only lost a handful of seconds in route choice. Once I had the flow going I finally felt able to hit full speed now and then and my super fast Schwalbe Furious Freds definitely were definitely not slowing me down! After crossing the line I had the fastest time, but given my early mistake I was sure that Lasse or one of the other fast four riders who had started behind me would appear any second. After a few minutes had gone by and all the other riders had crossed the line it was finally time to celebrate my second sprint gold in a row. There are no corny medal-in-teeth pictures yet as the prize giving is tonight, but below you can see a couple of pics of the pretty bouquet I received at the flower ceremony! AJ has managed to be the first man to successfully defend his sprint world champion title, winning the day over Estonia’s Tonis Erm by 18 second (he’ll write more about his race shortly). Steven also had an impressive ride in is first international sprint race, he was disappointed to lose about a minute towards the end of the race but still finished in 22nd place in amongst some very experienced riders. Steve’s speed was on track for a top 10 finish! Alex and Grant were also happy with their rides, although Grant also had difficulty towards the end around the ruined castle. In the women’s race, Mel and Mary rode steadily and after Mary’s first control both girls had clean rides with hesitations to check the map. The junior men, all of whom were competing in their first international event, performed well. Chris was the first of the juniors in 28th place in a time of 21:50, he also had difficulty towards the end of the course. Marc was only one place behind in a time of 22:02 and felt that he’d managed to maintain a speed that he could still navigate well. Luke made a mistake on the way to the first control and was caught by the prepubescent Italian junior boy and kept seeing him through out the race. Ultimately he finished in 39th position in 23:54. Yesterday we moved from our bungalows in Chaves to a five bedroom, two story house in Montalegre . There was some intial concern because despite the five bedrooms and eleven beds the kitchen seemed to be equipped for a group of four :-S The extremely generous and helpful owners returned shortly after we arrived with plates, bowls, mugs and most importantly enormous saucepans to cook up dinner for 11 hungry riders. Today we rode on the model event map around Montalegre which is a steep network of small cobble stoned streets. The hardest part was trying to read the map with the vibrations of the cobblestones. Steve has discovered that the cobblestones also cause his glasses to shake off and so he’s manufactured an elastic-band strap to hold them on. Some of you might be interested in checking out the “Dream team competition”. The idea is that you have 30million euros to spend on 6 riders: 3 men and 3 women. You can only have 1 rider from any given country. The three events that count towards your final score are the middle and long distance finals and the relay. For the individual races the winner gets 100points, 2nd gets 99points and so on, where as in the relay the second place will get 95points, 3rd will get 90points and so on. More information on the rules can be found via the link above along with a table of how much each rider is worth. The Sprint Final will be held in Chaves tomorrow. First starts are from 9am (1800 EST) and, with 1 minute starting intervals, all the riders are expected to finished two hours later. The warning we have about the vehicle and pedestrian traffic is as follows: “Car traffic will be restricted in all competition area. No cars will be allowed to enter the area, but it is impossible to control cars parked inside so some traffic is expected. The controllers will warn drivers and pedestrians to be careful and will also give information to the competitors about eventual obstacles.” We have been discussing the various merits of a) yelling at every corner in case there is a rider or grandmother coming, b) riding down long flights of stairs or running them and c) riding slowly and carefully to avoid collisions! We continue to train in the morning and rest in the afternoon due to the heat. I can not find any definite statistics, but so that you know we aren't just whinging, the cars have been reporting temperatures of 42 - 44 degrees in the afternoon!! The local swimming pool and the airconditioners are well used. Steve's bike is now fixed and Mary's has arrived and they are both very happy. Today we trained on a map that is adjacent to the long qualifying race - you can see a copy of this map here. Kay set a short course such that we could avoid most of the hills and still get a bit of practice through the small villages, which are proving to be come of the most confusing sections. They are generally small cobblestoned streets, with driveways that are also cobbled, so you need to be careful to take the correct turns and not end up in a dead end in someones back yard. The training area was up the hill from the campground so the boys and Kay took the opportunity to ride home down the sweeping turns of the main road (I'll chase down some photos from them). Tomorrow we move into the WOC accommodation and Saturday will be a model event. In the meantime, here a couple of anecdotes that have been amusing distractions from training and the heat. On the first night we got the offer of icecream and orange or apple. However we shortly discovered the choice was actually between icecream, orange or apple, a subtle difference. When we tried to clarify the choices with the waiter he explained (in a voice that indicated he could not believe he needed to explain this simple concept) "No, no, no. Orange, orange. Icecream, icecream". To complete the picture this was accompanied by exaggerated gesticulations that demonstrated that these were two seperate items. Needless to say, we quickly learnt the difference and those icecream eaters have avoided ending up with a plate of sliced orange. Mel: "You cut them into boats and freeze them"
Kay: "But, how long do you freeze them for?" Mel: "Until they are frozen"
Kay: "And how long do you keep them frozen for?" Mel: (now quite confused about these questions): "Until you eat them!?!" As promised I have a few results from the races over the weekend. It was hard to judge　how seriously the small collection of international riders were taking these races or how hard they were racing. I guess what I`m trying to say is that the results from the weekend are, at best, a rough guide to how well we and they are riding and navigating. Both races started and finished in the small village of Tinhela. The middle distance on Saturday was physically demanding because of the steep hills and rocky tracks. (As an idea, in the womens course we had 17,6km and 500m of climb). The route choices in the long distance (Sunday) involved a lot more sealed road sections, which meant that the courses did not feel so much more physically demanding as we were anticipating. AJ was even expecting a second map at the end of the long!. Both days were hot, dusty and rocky. Marc was the only one of the Aussiejunior boys to complete two full races and finished in a very commendable 6th overall. He eased into the races, taking Saturday steadily to get used to the map and terrain and he finished in 9th in 85mins and improved on this result on Sunday finishing in 101mins and 5th place. As previously mentioned, Luke didn`t arrive in time for the event on Saturday. He organised himself and rode on Sunday, finishing in 123mins in 16th place. He tells me it took him a while to get into the map and get use to the animals (dogs, cows, goats, donkey) and local farmers who were out and about on the map. Chris mispunched at a control that was on a similar feature and was a sequential number. He otherwise had a good ride and would have been in about 6th place. On Sunday, Chris was suffering from the effects of the start of a cold, he drank his way through 2 bottles and found the second half of the course very draining. He finished in 130mins and came straight back to the car for more water. AJ , he finished 2nd overall behind Denmark`s Erik Skovgard Knudsen. His time on Saturday was a mere 2 seconds behind Erik in about 65mins and he then relaxed the pace a bit for Sunday`s ride. 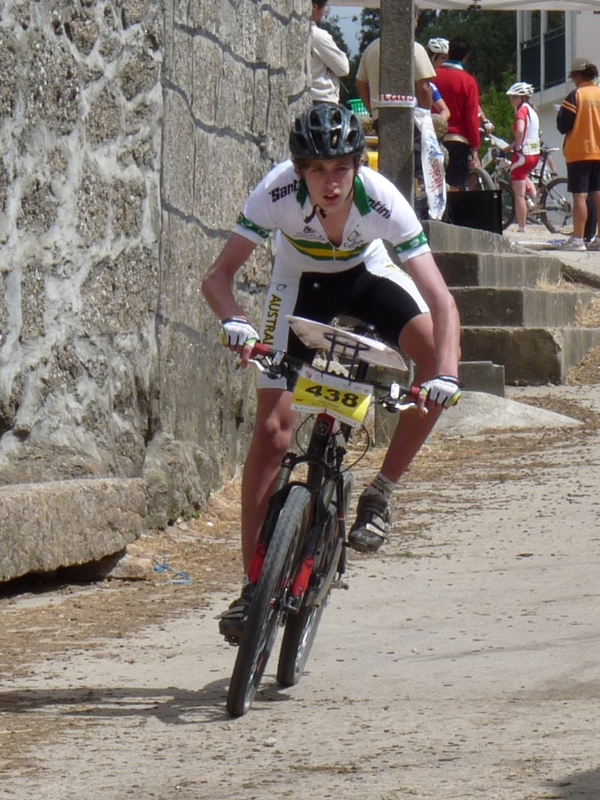 Alex finished 5th overall having riden solidly both days. Like the rest of us, his main comments about the races included adjectives such as "hot", "steep" etc. Grant ended up in 13th place overall. He had the closest encounter with the local animals on Saturday when a dog was chasing him and literally nipping at his heels. Steve rode solidly on the first day, but had some trouble with one of the controls and finished in 89mins. At one point on Saturday`s course he was brave enough to go through a herd of cows with rather large horns - an international junior who had been too scared to disturb the cows gingerly followed him through. Unfortunately, Steve had a flat and then a crash in the long distance and didn`t end up finishing the course. (Update on Steve`s damaged bike: You will be pleased to know that his spare parts are on their way and the bike will soon be fixed). Rikke Kornvig from Denmark won both days in the Senior womens category. The Danish womens team (Rikke, Line Brun Stallknecht nee Pedersen and Ann Dorthe Lisbygd) will be hot contendors in the relay and individual events next week. Yesterday was a rest day with most of the team doing a short spin on the road or on a local map that includes our camping ground. The aim of the game was to avoid the hills or use very very low gears when they were unavoidable. Grant, Brihony and I went for a ride around this map and came across a church that had the most elabourate melody for when the bells on the hour that I have ever heard. 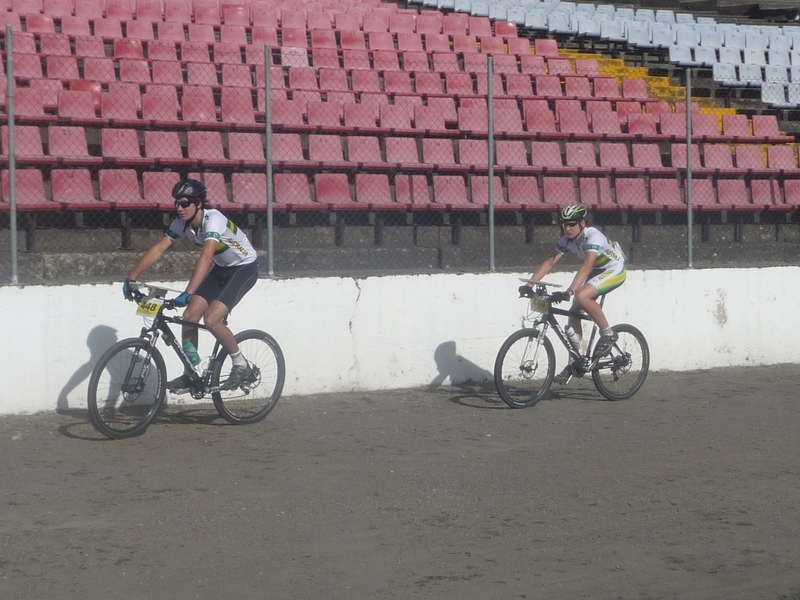 In the afternoon, Mary and I went with the junior boys into Chaves to look around the old part of town where the WOC sprint will be held next Sunday (the big boys went to find lunch and internet and an air-conditioned somewhere to watch the tour). The general impression is that we will have to remain very focused and take car in the network of narrow streets and tight corners. We have been assured that the town will be monitored so there are not many pedestrians and cars, but given people live in this town we have fears of dangerous blind corners and collisions. We`ll be heading in again through the week to have a closer look at the stairs and walls and other main features. Today`s training was on a map on the other side of Chaves. The mapping left a lot to be desired, particularly in one corner where there were more tracks, incorrect tracks and general confusion. I think many of us were just pleased to make it out without too many blackberry injuries and to find that everyone had experienced the same difficulties. Thanks to people leaving messages, and we`ll try to get some more event photos through the next week or so. Before I continue, we would like to congratulate those involved with the selection trials earlier this year. 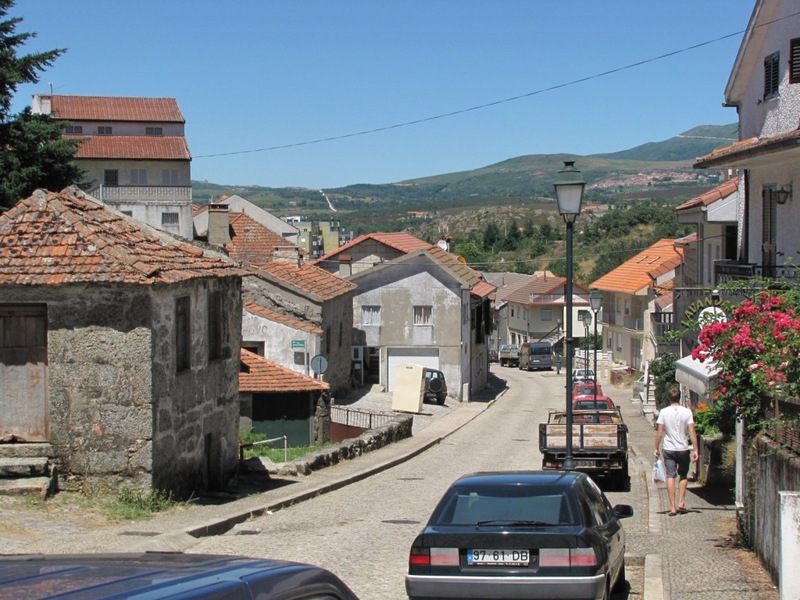 The general consensus is that the areas we have seen so far in Portugal are remarkably similar to Jenolan East. Well chosen! We all (expect Luke and Mary's bike, see below) met up on Friday evening at the camping ground near Chaves where we will be staying some cosy bungalows for the next week. Chaves is a smallish town, but has an enormous supermarket and a reasonably bike shop, so the basics are covered. The campgroud is good, although somewhat particular about each person carrying an identification card to make sure we are not trespassing into the campground. Luke has been travelling through Spain for the last couple of weeks and learnt the hard way that some European trains will not allow bikes to be taken on board. Even once packed. He rang on Friday morning to let us know that he was still in Barcelona and had mananged to book a sequence of buses that would have him arriving in Chaves late on Saturday night. A good lesson for all travelling with bikes. To our pleasant surprise he rang at about 7pm on Saturday to say that he'd found an earlier bus and was in Chaves already. Mary's bike is currently waiting for the customs officials in Porto to feel so inclined to sign it out. She has been road cycling around Italy and France in the last weeks and had her mtb sent by airfreight. Unfortunately, British Airways decided to send it later than expected and it arrived in Lisbon some hours after she drove northwards. And the terrain and races? Less that a fortnight to go!! With less than a fortnight to go, the Australian team has begun arriving in Europe and will be meeting up next weekend for some warm up races in Portugal. In the meantime you might like to check out the official website of the champs, particularly the 25 Days 25 Names section. I thought it was a cute idea - the organisers are introducing a new rider each day for the final 25 days before the races start (ie 12 riders have already been ¨introduced¨). Currently, the weather in Chaves is forecast to be fine and the maximum temperature ranging from the high 20´s to low 30´s. We´ve heard rumous of 40 degree days, so we´ll be keeping a close eye on the forecasts closer to the champs and on our (re)hydration!! 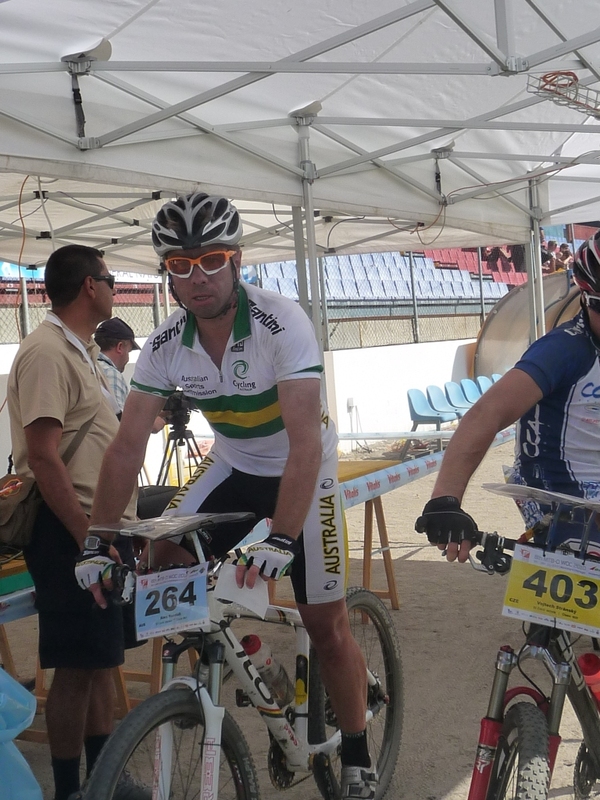 Before each world cup or championship race the organisers hold a ¨team leaders meeting¨ and being the only Aussie at the races in Poland I was attending these meetings. 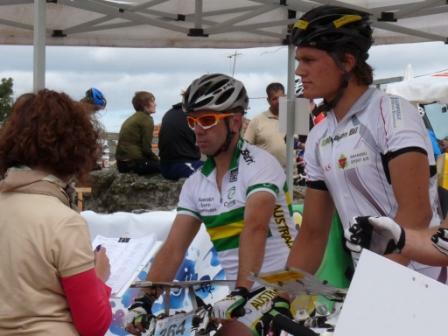 It is a time when you can ask the organisers for clarification about the race, rules or mapping etc. After riding on the model event map, many were wondering if the fallen trees had been mapped on the competition area because several were missing from the model map and obviously might affect your route choice. We were assured that the maps had been reviewed on Wednesday and printed on Thursday ready for the races to begin on Friday. I was the first to start in the W21E category and given the above assurance, you may imagine my surprise to find an enormous tree obscuring a junction to the first control and I lost a bit of time working out what was going on. Calmed by thoughts that everyone was going to meet the same situation I continued on. It was a physically demanding race with many unavoidable steep pinches that were unridable - so much so I found myself wondering if there was merit in training for running with the bike up hills (something I am generally morally opposed to!). 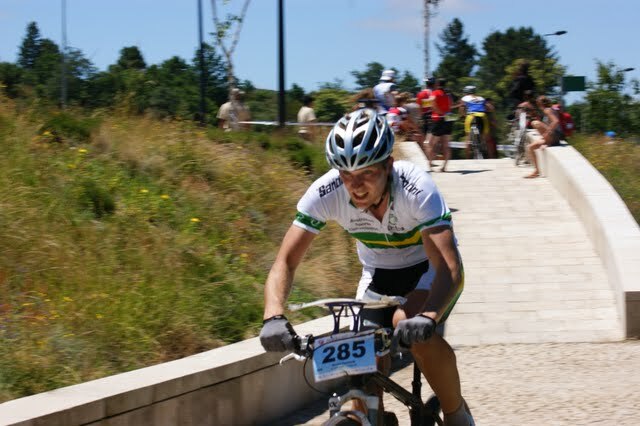 This was a much more enjoyable race, mostly because we spent less time pushing our bikes up steep pinches or over fallen trees – after all, part of the reason I like MTBOing so much is because of the riding! With the exception of the 6th control I had a really good ride, but unfortunately I lost 6 – 7 minutes on that one control. I had navigated really smoothly and at a good pace until about 30metres before the control where I am sure there was an unmarked, albeit indistinct, track that confused me and it took me some time to work out what had happened. There were a couple of other times where I lost 20-30 seconds but these paled into insignificance and I came back with mixed feelings – very satisfied on one hand that I had ridden and navigated really well and a bit disappointed on the other that I had lost so much time. Michi won again in 52:57 and I finished 17th in 63:21. The mixed relay was held on Sunday in the same forest used for the middle distance race. I did not compete in these races because I had no Aussies to race with and it was convenient for me to fly back to Norway on Sunday morning. Given I didn´t have to save myself and my legs I took the time on Saturday afternoon to ride up to a lookout over Gdansk and afterwards went for a long walk which took me back to the park used in the sprint. Down near this park I got to sit in the sun, on a sandy beach and pretend that the water was not quite so murky or cold. There is now less than 5 weeks before the world championships and the team will be meeting up on the first weekend of July for a couple of races in Portugal and then a week of training / familiarising ourselves with the type of terrain.